The end of Twist’s CPA-commissioned THE RITE OF SPRING, in development at the Basil Twist Residency, March 2013; Memorial Hall, Chapel Hill, NC. KPO Photo. “This is the program I’ve been most nervous about in the last three years, and it means the most to me,” said Emil Kang in his slightly giddy introduction to the world premiere performance in Memorial Hall April 12. Basil Twist. Photo courtesy CPA. 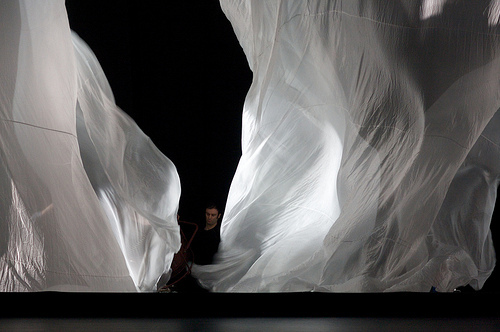 Coming up was the final of the artist projects that Carolina Performing Arts commissioned as part of its season and year-long “The Rite of Spring at One Hundred” series. Basil Twist, the renowned puppeteer (for lack of a better word), was about to present his puppet ballet set to Igor Stravinsky’s The Rite of Spring. The Orchestra of St. Luke’s was already in the pit; the house was packed and buzzing with anticipation. Kang was nervous–but he would have already known how completely marvelous the work is. Creating the work during the Basil Twist Residency, March 2013; Memorial Hall, Chapel Hill, NC. KPO Photo. Basil Twist’s The Rite of Spring is a total work of art, an enchanted place/time of power and mystery, and it fills the viewer with amazed delight, foreboding, tenderness and a host of other responses. The experience of the stage action is not separable from the music rising from the orchestra, made by people you can’t see but whose warm humanity you feel acutely in contrast to the abstract dance of forces and objects on the cooly lit stage. (There are people–the puppeteers carrying out the magic–but they are dressed and shrouded in black, and barely register in the image.) When a live human dancer appears to dance the Chosen One’s “dance to the death” section, it tears at your heart. He’s so alive. You feel a huge rush of awe at the human body, how beautiful it is, how marvelous in all its joint and muscle. It is impossible to make this sacrifice abstract. A human will die. And, Twist has come up with a brilliant solution to express that moment–and, I think, to say something about how it is not only social ritual that snares us, but larger, ineluctable, forces. Animated curtains at the Basil Twist Residency, March 2013; Memorial Hall, Chapel Hill, NC. KPO Photo. This Rite goes so far beyond object theater that I don’t know what better to call it than ballet. But it is also painting and sculpture and architecture and projected image in addition to puppetry and dance. Twist’s definition of puppetry is completely open-ended: a puppet can be anything that can be animated, that is, given the life through movement. 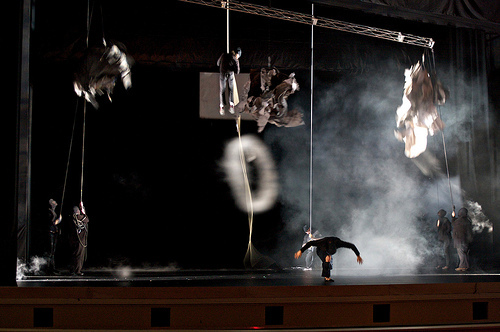 For The Rite, he animates the atmosphere, giving appearance to the motion of the air with smoke and billowing silk. I may be a little biased about how fantastic this was, because I love cloth so much, but to see so much glowing silken cloth hanging from the flies to the floor was wonderful. The curtain rises on–another curtain, this one hanging straight and flat. Suddenly brought to life with light and released, it falls in sensuous motion with a slight hiss. Behind is another…and another…I lost track–there are several. I couldn’t count and look at the same time–I went into pure sensory mode. I’m going to try to write on this again, when the verbal part of my brain returns from this image land. 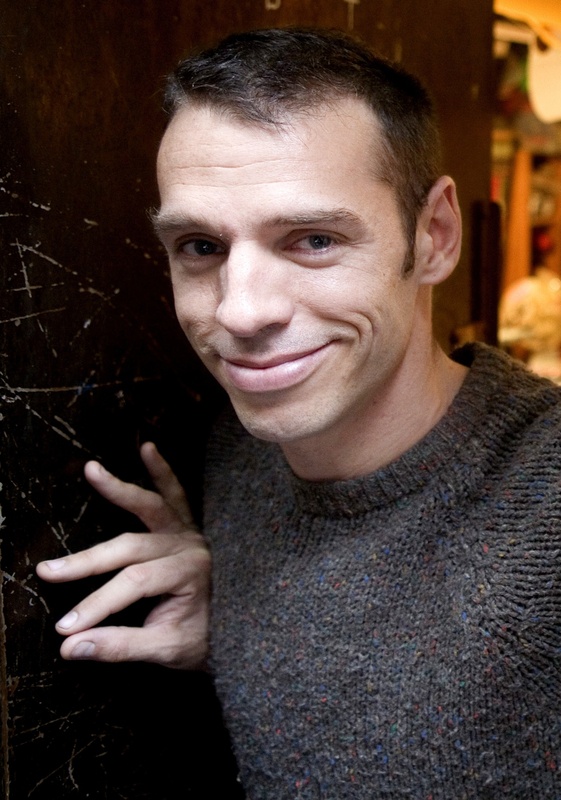 The show opens with two enjoyable and rather different works, to Stravinsky’s Fireworks, Op. 4, and the Pulchinella Suite. They are charming in themselves, but also lead the viewer down the road toward the new world to be encountered in The Rite. The Orchestra of St. Luke’s sounded wonderful; a small part of my brain was available to note how different they sounded from the Mariinsky, and that warm, softer-edged sound suited Twist’s dance very well. Sarah Howe, puppeteer, potter and ELF driver. On a local note: Quite a few local puppeteers, object theatre artists and suchlike are involved in this production. To my surprise when I read the program, I saw the name Sarah Howe–who I know slightly because she sells her pottery at the Durham Farmers Market each Saturday. She was there today, looking electrified. 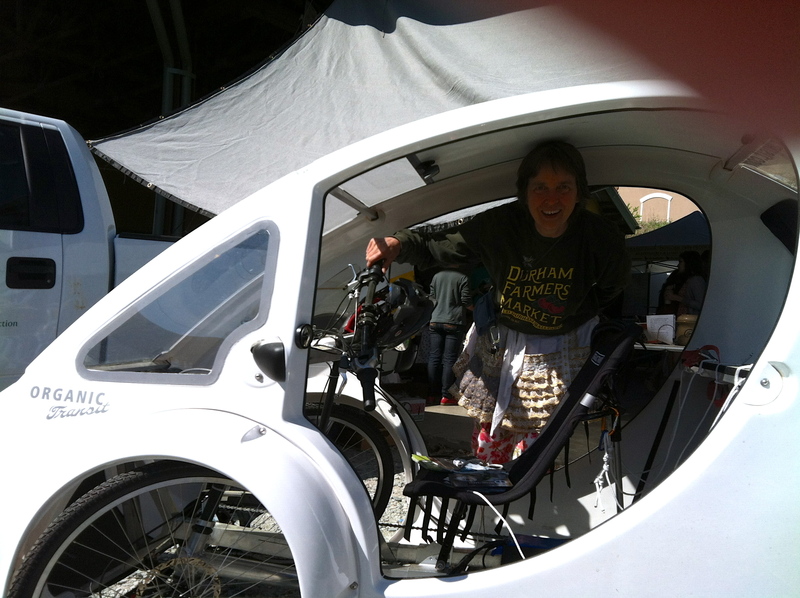 Not only had she worked the performance, she had gone to Chapel Hill and back in her beta-test model ELF–a bicycle vehicle made in Durham. 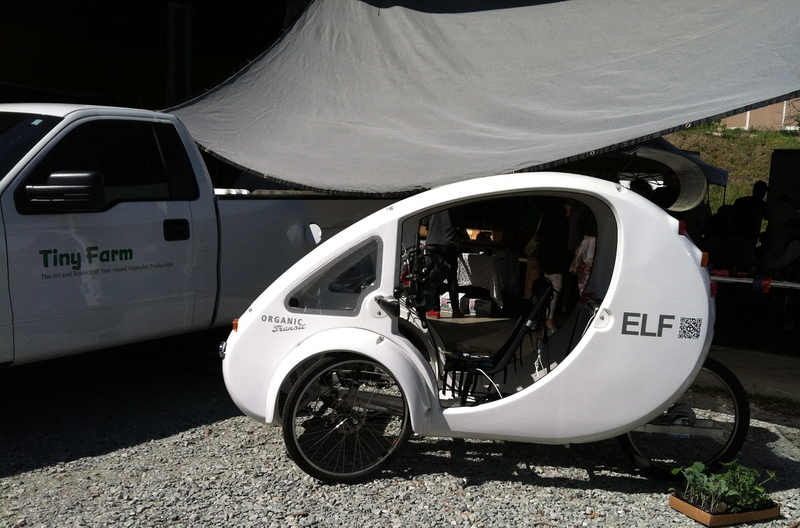 The ELF is made in Durham by Organic Transit. The 3-wheeler has solar power assist and LED headlights. Howe hauls pottery in the rear cargo area, and goes about 20 mph.